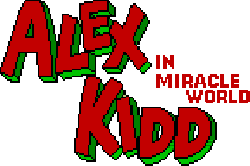 This website is dedicated to the memory of the greatest game of all times: "Alex Kidd: in Miracle World". I will find a lot of information and place it on this website to preserve it for all eternity. You will also find information about the system "Alex Kidd: in Miracle World" was created for: the Sega Master System. 20-04-2009 Daniel Mafra of Brazil is working with different people to create a remake/revival of Alex Kidd: in Miracle World in which it is possible to control Stella, Alex' girlfriend from the arcade version of Alex Kidd: the Lost Stars. Please contact Daniel if you are an artist and want to help work on the game. Check out the game here. 05-02-2007 Darmon Xavier has released a very promising Alex Kidd in Miracle World remake. The first level is implemented and new levels can be created by modifying a text-file. Check out the game here. 11-01-2007 Tom 'Konnan' van Mol has released a great speedrun of Alex Kidd in Miracle World at SpeedDemosArchive.com! 17 minutes and 33 seconds is all that he needs to finish the PAL version of the game. The files are available here: here. 16-12-2006 Christmas is coming early this year. I can now disclose that the mysterious "anonymous person" referred to below is Galak6 and he has now officially revealed his Alex Kidd website! 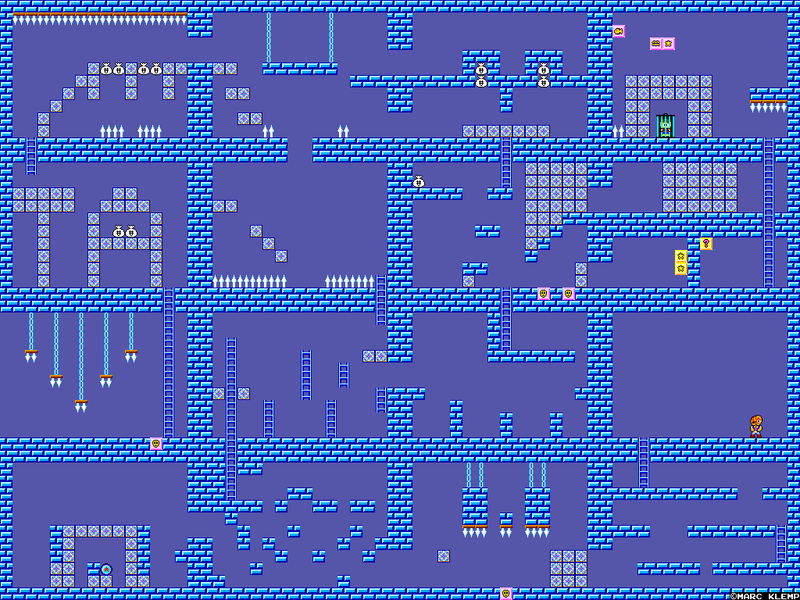 It contains complete levelmaps for Alex Kidd in Miracle World and Alex Kidd in The Enchanted Castle and maybe more to come. There's also a forum, loads of scans and an Alex Kidd christmas decoration. Overall the best Alex Kidd shrine out there! Oh, and by the way Merry Christmas to everyone! 25-09-2006 The great Sega Master System site, Sega8Bit.com, has had a poll on the top 100 Sega Master System games. It's no surprise to see Alex Kidd: in Miracle Word in the top of the list! 02-05-2006 To follow up on the news just below: the Alex Kidd site supposedly suffered a fatal death before being released to the public. One guy, who will remain anonymous for now, is working on yet another AK-site. As with everything on the "AK-scene" don't freak out in bliss just yet. It may take a while before the site is up and running, and as we all know - it may never be released at all! According to my anonymous source, the page is 20 % finished, and it will be released when it's about 50 % finished. The page is most likely going to be here. 04-03-2004 A Sega Master System commercial including AK:IMW-footage, is now available from the newly created media-section. Also, a new Alex Kidd website is under construction by people from #SMSPower on EFNet, IRC. 11-07-2003 The page is updated. A new section has been added: Fan Material. Minor additions and corrections here and there as well. 22-05-2003 Whee, today the prize arrived, and Sega threw in a lot of Sega merchandise too! A pure silk Dreamcast scarf, Sakura Taisen keyrings from 1996, a Jogurt pouch, Panzer Dragoon Orta ornaments and a whole lot more. I will take some pictures of the Alex Kidd drawing by Ossale Kohta as soon as I get it framed. We investigated anew by your report:"The prize had not arrived". Finally, we found this item was not yet shipped. It was caused our mistake of the arrangements, and informational crossing. We are very sorry for you, and we apologize to you from the heart. We will try hard for such an accident not to recur from now on. Today, we shipped this item to you. So, I am sorry if there is impoliteness. 18-05-2003 Deleted all news-posts concerning my videogame-purchases as they were irrelevant to the site. I'll only post AK:IMW, Sega Master System and site related news from now on. Oh, and I think I should mention that I'll put up all my future Sega Master System demos/programs on this page. 27-11-2002 A new Master System page went up today! It looks great, though there's not much content yet. I'm sure it will be one of the very best Master System sites on the Internet, and i wish the webmaster the very best of luck! 18-11-2002 Not much has happened, but felt like posting. I have still not received my prize from the Alex Kidd contest, so I'll probably have to snail mail Sega Japan to nag them about it. Oh, and I ordered a Sega Saturn w/ two controllers and 15 games today. 15-11-2002 A new Master System has been produced by Brazilian Tec-Toy. It comes with 54 games built in and two joypads (6-button). One of the games is the Tec-Toy developed 20 em 1 (20 in 1), so you might argue that it comes with 74 games. It seems the Master System will never die! 29-09-2002 I just found out I won the Sega.jp Alex Kidd contest! I'll receive a drawing of Alex Kidd, signed by Ossale Kohta sometime. Ah what a day! 20-09-2002 Added a link to the great Swedish Sega Saturn site, www.saturnuniverse.cjb.net. Uploaded a complete map of level one (Mt. Eternal). Get it here. 15-08-2002 Today I made a map of level 8 (The Radactian Castle). You can get it here. Expect more stuff like this. 27-04-2002 I've redesigned the page.